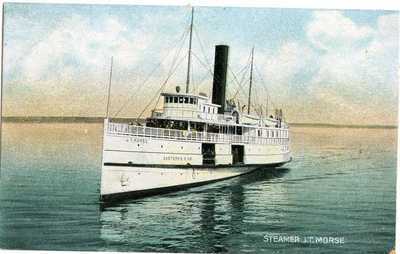 "Steamer J.T. Morse " by Hugh C. Leighton Co.
Postcard featuring the Steamer J.T. Morse, the Hugh C. Leighton Co., Manufacturers, Portland, Me., U.S.A., printed in Frankfort Germany. A note in the finding aid for the collection (MS 835 sc) mentions that items in the collection were originally glued in back of a copy of John M. Richardson's book Steamboat Lore of the Penobscot located in the William H. Hahn library. ship, boat, steamer, postcards, Maine, Eastern S.S. Co.